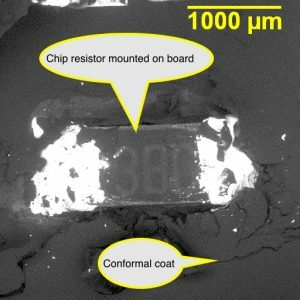 Resistor Failure Analysis - SEM Lab Inc.
Chip resistors can corrode and increase in resistance or go open circuit due to sulfur in atmospheric pollution. The conformal coating was removed to exposed the top of the resistor. 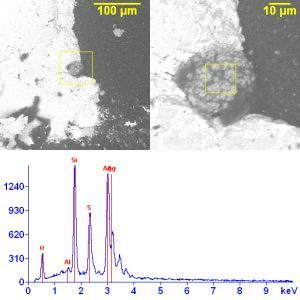 SEM/EDS analysis of an apparent corrosion bloom suggest that it is silver sulfide. 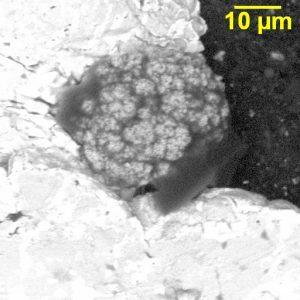 This is a higher magnification image showing the structure of the bloom. What is the solution to avoid increase or open resistor? There are special grades of chip resistors that are designed to be resistant to corrosion. Ask a main stream manufacturer for information on what is available. The best solution is prevention. Two things come to mind here and of course cleaning is first. If any paying solutions are left behind our a water soluble fix is left under the chip, corrosion can occur over time in most environments. This is so true under conformal coat. Test the surface cleanliness using an Omega meter as another means to check. Second thought is mixed metals under pressure, or hardware, can start corrosion like rust on a car. Start a DOE to isolate the measurable conditions, measure cleanliness, conformal coat, and then Steamage for quick results.